Mount Camdeboo Private Game Reserve lies just to the east of Graaff-Reinet in the heart of the malaria free Eastern Cape’s Great Karoo. Luxurious beyond expectation. Come and experience a personalised safari in a region that is steeped in history and culture. 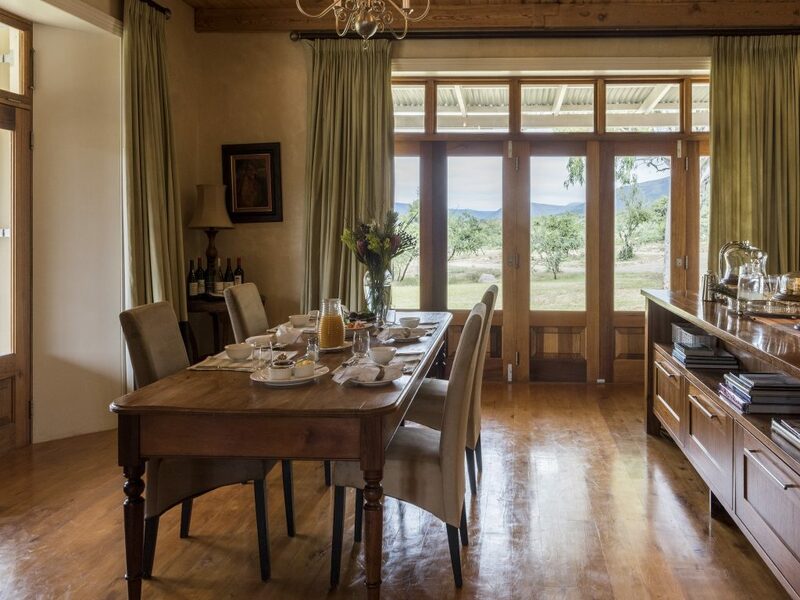 Guests are accommodated in four Cape Dutch houses that lie cupped in the palm of the Sneeuberg Mountain range. Once homes to generations of settlers, these magnificent homesteads have been sensitively converted into havens of five star luxury. FAMILY FUN Mount Camdeboo offers the very best family holiday you can imagine; a time to relax and enjoy special time with your family, to reconnect and share the excitement with your children as they discover Africa, up close! Accommodation in gracious homesteads means that children are not in separate units, rather comfortably next door or across the passage, just like home … Far more than just a place for children to experience nature and animals; rolling lawns means lots of room to run, play games, have fun with a soccer ball or explore the pathways through Camdeboo Manor’s beautiful gardens – and generally, enjoy relaxing as a family. Daytime means safaris to see animals, fun in the gardens and around the pool, a visit to the small cat project – a highlight for our mini-guests, and lots of delicious ‘kiddie-friendly’ treats! Evenings around the boma fire roasting your own marshmallows, fireside stories and the thrill of watching a falling star – before heading off to bed to dream of today’s fun bug-safari and tomorrow’s adventures that await! Every family deserves a family holiday on Mount Camdeboo! Mount Camdeboo offers a variety of accommodation options, from intimate lodges to a sole-use safari villa, and for those wanting to immerse themselves in the bush setting, two luxurious safari tents. Dating back to the late 1700s, Courtyard Manor is a gracious, double gabled homestead wrapped in a deep veranda. Comprising four tastefully appointed en-suite bedroom suites, the manor honours its original name of Ou Werf (a bustling village square) as it is well suited to accommodating a private party where sociability and smiles feel right at home. Situated in a secluded part of Camdeboo Manor’s beautiful gardens, Peppertree offers a romantic setting for honeymooners or couples seeking privacy. The spacious cottage features a King-size bed, fireplace, luxurious en-suite bathroom, kitchenette and a private garden. Just like our menu, our evening dining venues are varied. One night you may be supping under the twinkling Karoo stars (an essential part of the African experience) – complete with full course silverware and a dedicated chef cooking right before your eyes. While another may find you dining in a secluded courtyard or even in the company of a roaring dining room fire. It’s a little touch of surprise and a highly enjoyable way in which to absorb the splendour and diversity that Mount Camdeboo has to offer you. 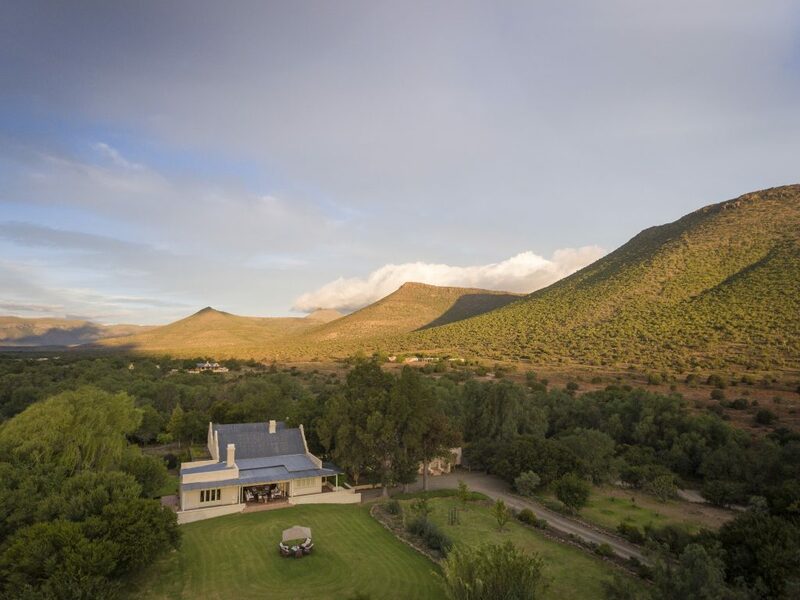 Mount Camdeboo Private Game Reserve is situated just to the east of Graaff-Reinet, in the heart of the Eastern Cape’s Great Karoo, and offers an exceptional malaria-free safari experience in a region steeped in history and culture. This 14 000-hectare or 35 000-acre property lies cupped in the palm of the Sneeuberg mountain range, the second-highest range in South Africa. It provides guests with a unique game viewing experience due to the combination of four biomes and an altitude range of almost 5000 feet. From the bush thickets and riverine areas to the plateau grass plains with the backdrop of the majestic mountains, every game drive is a breathtakingly beautiful experience. Mount Camdeboo Private Game Reserve lies just to the east of the town of Graaff-Reinet, in the heart of the malaria free Eastern Cape’s Great Karoo area. A 280 km trip (approximately 3 hours) by road from the closest airport in Port Elizabeth, with daily flights from Johannesburg, Cape Town and Durban. Two private airstrips are also available for guests choosing to charter in. Guests can be collected by Mount Camdeboo’s recommended transfer company from Port Elizabeth Airport or self-drive to the reserve (car hire is available from the airport; roads are in fair condition and standard vehicles are sufficient). Travel 500m and at the 3rd set of traffic lights turn left onto M4 Settler’s Way. reception ends after 3 km along this gravel road. Keep driving through the Samara gates i.e. one single and two double sets of electronic gates with push buttons until you reach the Mount Camdeboo Private Game Reserve main automatic electronic double set of gates. Please click here to view Mount Camdeboo’s special offers. Please click here to view Mount Camdeboo’s rates. Enjoy the beautiful architecture, museums and craft shops in the genteel town of Graaff-Reinet (60km). Take a trip to the nearby town of Nieu Bethesda (120km) and visit the famed Owl House where a recluse artist who filled her home and garden with highly unusual cement and glass sculptures once lived.